My name is Matt Winick from Ann Arbor, Michigan with a strong interest in learning history, social justice, and diversity. In these subjects or core values I like to learn the need for Civil Rights to be stronger to reduce discrimination, have diversity to make society a better place for people with different background, have education reform to make learning a better place, and many others. 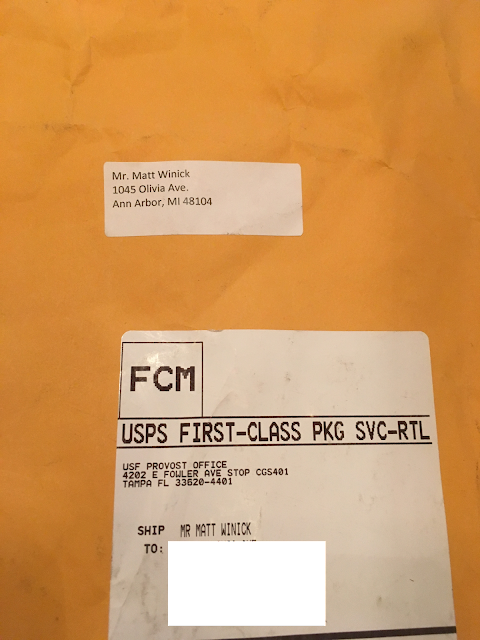 President Genshaft, the main reason I’m writing you a letter is to explain how I find your work as 11th President of the University of South Florida System to be very inspiring to me. 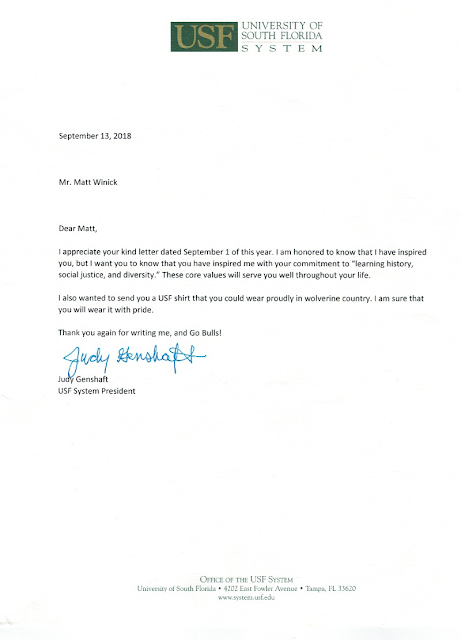 In your current role as 11th President of the University of South Florida, I truly appreciate on how you are a strong supporter and advocate for Civil Rights by advocating for people with disabilities’ rights and working to reduce discrimination in University of South Florida to help protect minorities including people who come from different background. To improve education, I liked on how you work on providing accommodations like extra time on exams including have educational software to help assist them on improving comprehension to students with disabilities to help them get assistance on learning different subjects, expanded more liberal arts classes including diversity educational awareness programs to help make learning education diverse to learn, and expressed the need to reduce tuition costs to help students or people afford to go to college. Another thing that I really like about your work as University of South Florida is how you worked on expanding more research programs to help engage students to understand more science or other different topics, teamed along with businesses including industries to help students get internships or get a job after they graduate, improved diversity by hiring women, minorities, and people with disabilities to work for the college, and created “Women’s In Leadership and Philanthropy program” to help women including women who are minorities engage in the community along with help assist them on getting an education. Besides your work as President of the University of South Florida, I like on how you are an advocate for the need for immigration reform to help immigrants, dreamers, or refugees get an education along with protect them from being oppressed and speak out against the Florida state legislature in both political parties on cutting funds for colleges to help improve education along with reduce laying off people who work for the colleges. President Genshaft, I have autism with a learning disability. Having a disability is hard for me because I have trouble comprehending on learning different advance subjects, sometimes I struggle to communicate my thoughts, and get teased. Your commitment to be a strong supporter and your advocacy for Civil Rights including people with disabilities’ rights really inspires me to work hard on my disability. On Youtube “Leadership Spotlight: Dr. Judy Genshaft USF” I enjoyed learning about your life on how you became the President of University of South Florida, some of your goals to improve the university on education, research, and diversity. Also I enjoy visiting Tampa Florida a few times like seeing downtown Tampa, learning about the Cuban culture in Ybor City, and many others. Your role as President of the University of South Florida helps give me motivation to continue to learn history and social justice and diversity. My future goal is to work in these areas to help emphasize the need to make Civil Rights stronger to reduce discrimination, improve social justice to make communities a better place for people who come from different background, and many others. I strongly believe that you are making a great difference in your current role. I’m very proud on how you are working hard to improve diversity, push for education reform, and strongly advocate for common sense ideas. You have truly inspire me to work hard on my disability and be motivated to continue to learn history, diversity, and social justice. Thanks for taking the time to read my letter, working hard to make a great impact on society, and inspiring me. I hope someday I can visit University of Southern Florida when I visit Tampa, Florida. I wish you the best to continue to make a great difference for society.